Hi Tone Clear Wax is an extract derived from concentrated marijuana oils. Hi Tone products are of high quality, and 100% safe to use. 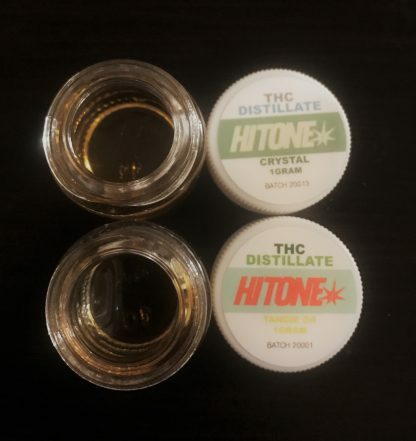 And this 91% THC Fractionally Distilled Marijuana Wax from Hi Tone is as pure-as-can-be. This indica wax is highly potent, and has long lasting effects. It is perfect for marijuana patients that need help with serious pain, stress and sleep disorders. This Indica THC Distillate from Hi Tone will make you feel extremely relaxed and/or sedated. The indica effects of highly potent indica makes it better suited to evening use just before bed, or after you might have cleared out your schedule, or on lazy days when there are no physical tasks to handle. THC level averages at 91%, making it one of the purest and most powerful indica wax concentrate anyone can find on the market. Why should I buy Hi Tone Clear Wax? This Indica Marijuana Wax Concentrate is fractionally distilled. Fractional distillation is a highly technical refinement process that takes away all impurities and extraneous plant materials to achieve super concentrated high purity medical-grade THC. Hybrid 1 gram; Sativa 1 gram. What are the Best Cannabis Strains for Pain Management? Copyright © 2018 KoolMj.com | All Rights Reserved.